Desk Pads by JKS Marketing Inc.
We offer the Classic Desk Pad in Traditional or Transitional Styling. Our desk pads are made with a leather-like vinyl (Morbern Ambassador) or quality Leather. The appearance and feel of the vinyl is very close to that of leather; in fact, most of our customers cannot tell the difference. The standard colour for vinyl and leather desk pads is black. Other vinyl or leather colours or C.O.M. can be specified. There is no minimum quantity for vinyl in colours other than black, just a 10% surcharge. 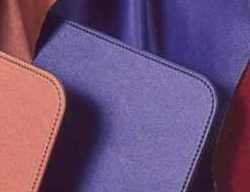 For leather colours other than black please call for quotations. For tips and information visit our Leather Tips & Facts and Vinyl Tips & Facts Pages.